Last month I read this article in Christianity Today about an issue that Compassion International is having in India. In short, it seems the government is actively trying to force Compassion out of India by limiting their ability to transfer funds into the country. Sadly, if this happens 145,000 impoverished children will be the ones who suffer. I don’t know specifics about this situation beyond the article, nor am I familiar with how Compassion has structured their organization in India, but this article caused me to reflect on the NGOs (non-governmental organizations: aka non-profits) we have established in Brazil and Thailand. So what makes Living Bread Thailand so special? The entire leadership of Living Bread Thailand is Thai. There is an American couple who serve as advisers for the Thai Board of Directors, but Living Bread Thailand is unquestionably a Thai led organization. An examination of many Western ministries’ websites will reveal how unique the exclusively Thai leadership of Living Bread Thailand truly is. I believe one of the many benefits of this level of local (non-Western) leadership is favor among the local communities and governing officials. 2. Local churches planted in, and seeking the welfare of, the poorest communities. Our mission is comprehensive. While establishing Living Bread Thailand we were able to point to the work of Living Bread Brazil (which has a Brazilian Board of Directors). We demonstrated that while we were evangelizing and making disciples, we were not only proselytizing. Our church plants are made up of genuine disciples who engage their communities in a transforming way. I have seen this to be a successful and, most importantly, Biblical model of comprehensive ministry among the global poor. I am not saying that Compassion is not doing these things; it seems their issue is a government determined to remove them. However, I do believe Living Bread Thailand’s and Living Bread Brazil’s unique approach has garnered us goodwill even in places not historically receptive to NGO’s with overtly Christian missions. For these reasons I believe Living Bread’s approach is both revolutionary and worthy of your financial support. 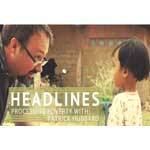 Patrick Hubbard has an extensive business and ministry background. He worked in the hospitality industry as a General Manager and as a Regional Manager. Along with his wife Bárbara, he is part owner of Freegrance Products LLC, a social enterprise seeking to empower women to escape poverty and avoid human trafficking. Patrick and Bárbara are also the founders of Living Bread Ministries where they have committed almost thirteen years to comprehensive ministry among the global poor. He has also served as a staff member of a local church. Patrick holds a BS in Religious Studies and a MA in Global Studies from Liberty University. He is currently pursuing a MBA from Old Dominion University.